The small island nation of Vanuatu held an election for the Parliament on 22 January. The election was called after fourteen MPs, including the Deputy Prime Minister and a number of other cabinet ministers, were sentenced to prison terms between 3 and 4 years for bribery. Despite an attempt by the Speaker (who is acting president when the President is out of the country, and is also one of those found guilty of bribery) to pardon himself and the other MPs accused, the sentences stood. Following this, President Baldwin Lonsdale (on the advice of Prime Minister Sato Kilman, who knew that he would likely face defeat in Parliament when it was recalled) called an early election. I have written more extensively on Vanuatu's political history here, but that's quite a long story. It was initially a colony, governed by both the United Kingdom and France (with two entirely seperate systems of government, justice and law enforcement). At independence in 1980, Vanuatu's politics was dominated by two parties; the anglophone, socialist Vanuaku Party, and the more conservative, Francophone Union of Moderate Parties. However, over the years, this two-party system has totally disintegrated. In 1991, two new parties split from the Vanuaku Party, and this has started a trend of both party splits and new parties. At the first post-independence election, the effective number of parties in terms of seats was 2.1; at this election, it was 11.36 (and even that number is an understatement, as it treats independents as one party). This has led to very unstable governments; in the 2012-2016 parliament, there were four Prime Ministers, and in the 2008-2012 term, there were six. While personality clashes within parties have lead to some of this instability, the electoral system is also a factor. Vanuatu is one of the few countries to still use the single non-transferable vote (introduced before the 1975 colonial elections by colonial officials who were not provided with any information on alternatives). As many of you will know, this system is linked with factionalised parties, and Vanuatu is no exception. However, unlike Japan and Taiwan, the factionalised parties at the start have not stayed together, and have split. Under SNTV, there is relatively little incentive for parties not to split, at least from an electoral perspective. I was in the country up until polling day, for unrelated reasons, and had a look at some of the campaigning (for images of posters, see my Twitter account). In terms of political reform (and with the caveat that I don't speak the language, though Bislama is not too hard to understand) I noticed little discussion, other than from the Vanuatu Presidential Party (whose position should be obvious). There was vague talk about ending corruption and supporting decentralisation, but nothing, as far as I could tell, about the electoral system. Vote distribution is an important part of the single non-transferable vote. If a party nominates too many candidates, their vote will be too split to elect many MPs; if they nominate too few they risk winning not enough seats. The vote also needs to be spread equally amongst the candidates, so as to ensure the maximum number of candidates are elected. You would think that a nation like Vanuatu, which has used the single non-transferable vote for a long time, would be doing this well. This is not the case. For example, in the seven-member district of Santo, the Union of Moderate Parties was the largest party in terms of votes, winning 14.34% (yes, that makes them the largest). However, they ran five candidates. Each one got no more than 4%, and they won no seats. In the two-member district of Epi, the Vanuatu National Development Party was the largest party, with 20.78% of the vote. However, they ran two candidates, and each one got about 10%. The two seats were won by one independent and one UMP candidate, who was the only UMP candidate. These sort of errors were widespread in Vanuatu, and the incompetent attempts for the larger parties to divide their vote only compounded the fragmentation, as they allowed small parties with only one candidate to win seats easier. The below chart shows how the seats were distributed, and how they would have been distributed under the D'Hondt system (applied only in areas where it would have made a difference). As you can see, the new system would be a boost to the largest parties (the VP and UMP), while it would remove some of the smaller parties and independents. This would likely be an advantage for government stability. One other thing I am interested in comparing is the equation outlined in Shugart, Bergman and Watt (2013), for estimating the vote share for the first candidate under the single non-transferable vote to the results in Vanuatu (this equation being 'P1=C-.75, where P is the vote share within the party of the highest polling candidate and C is the number of candidates). The below chart shows the correlation between the expected and the actual vote shares within parties is fairly strong. The exact correlation coefficient is 0.687, which seems to me to be quite good given the very odd circumstances in Vanuatu. Bear in mind that this includes losers, which Shugart has advised me are not neccesarily applicable to the equation. If they are removed, the coefficient jumps to 0.76. One final interesting point; the below graph plots the difference from the expected vote share for the highest polling candidate against the advantage ratio for the party in that district. It's worth noting that the linear trendline (as well as the correlation coefficient of 0.288) in this graph is relatively meaningless; the graph is dramatically skewed by the single data point in the top right. If removed, the coefficient drops dramatically, to -0.03. However, I don't have anything to compare this against, and I am curious as to whether the high number of independents and single-candidate parties means that parties where the highest polling candidate polls higher than expected do better. I intend to look into this further. Senate Reform-Do compulsory preferences below the line matter? Those who follow Australian politics closely will be aware that the government is introducing a bill to change the electoral system for the Australian Senate. At the moment, the Senate is elected using the single transferable vote in six-member statewide districts. Elections are staggered so that states elect twelve senators. The territories elect two senators only. At the moment, compulsory preferential voting is used for both the Senate and the House. This means that voters are required to number every box on the ballot paper. This is not such an onerous task for the House; however, in the Senate, larger numbers of candidates run. 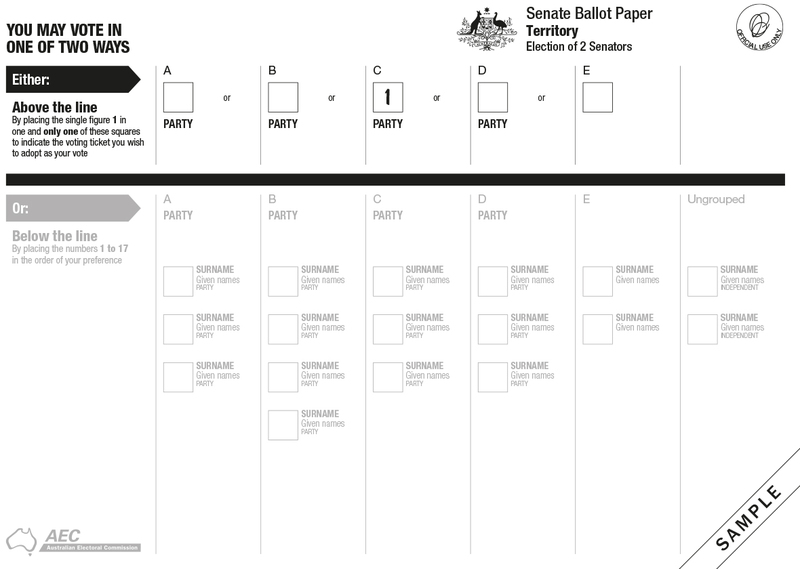 Up until 1983, voters were required to express a preference for every candidate on the Senate ballot paper by numbering every box. This led to a high informal rate, as candidate numbers increased. Following the election of the Hawke Labor government in 1982, the new government, motivated partially by political concerns about informal voting's impact on immigrant voters (who often voted Labor), introduced a new system. Compulsory preferencing was retained; however, before the election, parties could submit a ranked list of all the candidates on the ballot paper. Voters would put a 1 in the box above the line marked with that party's name in order to adopt that party's ticket as their vote. This system had the desired effect; the informal rate dropped significantly. However, it had other, less positive side effects. It meant that parties could transfer their preferences to whichever parties they liked. For example, in 2004, the Labor Party did a deal with the Family First Party, a conservative Christian group, to swap preferences. Labor expected the deal to result in Family First preferences coming to them; instead, it resulted in Family First, on 1.9% of the primary vote, beating the Greens (on 8.8% of the primary vote) to a seat. It has also meant that small parties can preference each other ahead of major parties, often regardless of ideology. This has meant that senators have been elected on tiny shares of the primary vote; for example, Senator Ricky Muir of the Motoring Enthusiast Party was elected to a Senate seat in Victoria off 0.5% of the primary vote by gathering preferences from a wide variety of parties. Kevin Bonham provides a more complete discussion of the issues. In recent days, the government has introduced legislation to change the Senate electoral system. The proposed changes would introduce optional preferences above the line. Voters will only have to number one box above the line (although the ballot paper will instruct voters to number six boxes above the line). This vote will go to the candidates of that party's ballot group, and, if no further preferences are expressed, the ballot paper will exhaust (be removed from the count). However, rather curiously, this provision will only apply above the line. People who wish to vote below the line will still have to number every box, though an extra two errors will apparently be permitted. This goes against the recommendations of the Joint Standing Committee on Electoral Matters. Exactly who insisted on this is unclear. The legislation is being supported by the Liberal/National Coalition and the Greens, and both blame each other for the proposition. The motivation behind the decision seems to be fear that with optional preferencing, voters will change the orders of party tickets. However, in my view, this is a baseless concern. Optional below-the-line preferencing, even if above-the-line voting is totally removed, has little impact on the specific people elected. In New South Wales, the same electoral system as recommended by the committee is used. Voters can vote for one group above the line, which counts as preferences for that group only. They can also number fifteen or more boxes below the line. At the last state election, 1.62% of voters who voted for groups with a box above the line voted below the line. At no point in the history of this particular system have these below-the-line preferences changed the order of election. You may ask whether the difficulty of numbering fifteen boxes against numbering one means that voters will automatically opt for the easy option. However, this does not appear to be the reason. Before the introduction of group tickets in 1988, New South Wales required voters to number fifteen candidates or more; there was no option for above the line voting. While parties put the candidates in order, it would have been no harder for people to vote against the party ticket. So, what happened? Well, according to Antony Green's paper on these elections, at each election about 98% of voters voted for the number 1 candidate in each ballot group, and about 98% of those votes transferred to the second candidate. In South Australia, a similar system was used. I am unsure whether voters were required to number a certain number of candidates. Once again, 98% of voters voted for the first candidate. The issue appears to be that Australian federal elections do not provide an opportunity for individual candidates to campaign for their own support, and Senate candidates of major parties are not scrutinised. For example, Joe Bullock, a right-wing Western Australian Labor senator, was forced to run for election again following the invalidation of the previous result. Bullock's conservative views received more attention during the by-election, and, as a result, incumbent left-wing Senator Louise Pratt outpolled him on below-the-line votes. In my view, it is foolish of the government to keep compulsory preferences below the line. If vote exhaustion is okay above the line, it is surely okay below. The political advantages of restricting below-the-line voting are irrelevant, and it would take a number of other reforms (decoupling House and Senate elections, abolition of above-the-line voting, rotating ballot positions, banning how-to-vote cards). However, for the same reason, it does not deserve so much attention; party ordering would likely remain the way Senators were chosen regardless of whether preferences were compulsory or optional. Note-The government has abandoned the requirement to number all the boxes below the line. Voters are only required to number six boxes, though the ballot paper will state that twelve are required. The Republic of Ireland, a nation which takes up of most of the island of Ireland, will be holding an election to the lower house of its parliament (the Dail Eirann). However, if Ireland were hoping to receive international attention for this election, they could not have timed it worse; it is taking place in the early days of the United States primary election, which is an incredibly competitive race. Nonetheless, Ireland deserves some coverage. From an electoral systems perspective, Ireland is one of the few nations to use the single transferable vote for nationwide elections. This is most likely a product of British influence; the single transferable vote was invented in the United Kingdom, and it was used for a number of local council elections prior to independence. This is part of a broader trend of the single transferable vote being used for elections where proportional representation was needed in former British colonies; it was/is used for indirect upper house elections in Burma and India, indirect elections in Hong Kong, and was used for Malta and Australia (eventually) for direct elections. The single transferable vote is entrenched in the Constitution, which means that any attempt to change it would require a referendum. This has been tried twice, for reasons that will become clear later in this post; at both attempts, it failed. The single transferable vote is a proportional representation system (though with a fairly low average district magnitude of 3.86), and so Ireland has a multi-party system. The Seat Product Model (a way of predicting party sizes based on average district magnitude and assembly size demonstrated by Matthew Shugart and Yuhui Li in a recent paper) would project Ireland to have an effective number of parties in terms of seats of 2.94, which is relatively close to what it has been. Ireland has been described as having a 'two and a half party system'. For most of its history, there were two main parties, Fianna Fail and Fine Gael, and one smaller party, Labour. However, in recent years, this system has been challenged by dramatic economic events, and the order of parties, as well as their identity, has changed. The banking crisis of 2008 and onwards led to dramatic change in Ireland's political system. The Fianna Fail-Green government was forced to spend billions propping up the banks, and was forced to cut spending and go heavily into debt. Indeed, the government was in such severe financial crisis that they were forced to call the International Monetary Fund into the country for a bailout. This led to a dramatic drop in popularity for the government, and an increase in popularity for both the established opposition and the new parties. The whole of the Irish legislature is known as the Oireachtas. The Dail is the lower house, and the upper house is the Seanad, or Senate. This body is not directly elected. Eleven members are appointed by the Taoiseach (the Prime Minister), six are elected by the graduates of Ireland's main universities, and forty-three are elected from 'vocational panels'. The electorate for these panels is the Oireachtas members and the local councillors, and the candidates are nominated by certain groups with attachments to the specific vocations or by Oireachtas members. The Seanad has heavily limited power; it can delay money bills by twenty-one days, and other legislation by one hundred and eighty days. While Ireland is nominally semi-presidential (the President is directly elected, although in many cases he or she has run unopposed), the President has very little power. He cannot veto legislation; but he can refer it to the Supreme Court court for checking its constitutionality, or, with the backing of a majority of the Seanad and one-third of the Dail, call a national referendum on it. While he formally appoints the Taoiseach, he can only appoint the choice of the Dail. Fine Gael is the current Irish governing party, and the largest party in the Dail, although it is relatively rare for it to hold this position. It originates from supporters of the Anglo-Irish Treaty (an agreement between Ireland and the United Kingdom to give Ireland independence in a similar manner to Australia, with a Governor-General and the King as formal head of state, and that formally conceded that Northern Ireland would not be a part of the Republic) which was opposed by the Anti-Treatyites. The party was the main opposition to Fianna Fail during that party's long stretch of government from 1957 to 1973. In that year, Fianna Fail were not displaced from their position as the largest party; however, they lost enough seats to make a coalition between Labour and Fine Gael possible. Those two parties have traditionally worked together the most, and they were in government for substantial proportions of the 1980s. During this time, however, they never came first in an election. They were defeated in 1992, after Labour cut their traditional ties with them and joined in a coalition with Fianna Fail. This did not last, and Fine Gael returned to government in coalition with Labour in 1994 until the election in 1997. At that election, Labour lost too many seats for the coalition to continue, and so Fine Gael were relegated to opposition. They stayed in that position after 2002, losing 23 of their 54 seats. Under new leader Enda Kenny, they recovered somewhat in 2007, though they were still substantially short of government. It was in the 2007-2011 parliament when Fine Gael really made dramatic advances. They surged into first place in the polls, and, despite a challenge by Labour, polled around 35% for most of the parliament. They won the most votes in the European and local elections in early 2009, the first ever of those elections to be won by Fine Gael. At the 2011 elections, they won the most votes and most seats by a large margin (see the below chart) and formed a coalition with Labour, and thus government. Enda Kenny, Fine Gael's leader, was elected Taoiseach. The government was left with a number of issues. Key amongst these was the economy; Ireland had a budget deficit of 12.7% of GDP. The government's first budget, which cut services and hiked taxes, was met with a drop in the polls for both coalition parties; however, Fine Gael remained substantially ahead of the opposition. Further cuts to services and tax hikes eroded Fine Gael support, and, while they mostly maintained their lead, opposition consolidation behind a surging Fianna Fail meant that that lead was substantially narrower than it had been. In recent months, however, Fine Gael has made something of a resurgence. They are now in the low thirties and high twenties in the opinion polls, and it looks unlikely that a viable government could be formed without them. Labour have traditionally been one of the weakest social democratic parties in Europe. They have only won more than 20% of the vote in an election once in their history; in 1922. A number of reasons have been given for this; one might be that, as Fine Gael and Fianna Fail are both relatively economically moderate, Labour's main difference from the large two parties has been its liberal positions on social issues, which have been controversial in Ireland. The previous peak for the party (excluding 1922) was 1992, when the party won 19.2% of the votes and 33 of 166 seats. However, their subsequent decision to go into coalition with Fianna Fail, and then with Fine Gael, drastically reduced their support at the next election, when their vote and seat shares approximately halved. Up until the crisis, their support languished on 10%. Following the banking crisis, Labour received a substantial boost in support. Indeed, in a number of polls, it looked like they could become the largest party, beating Fine Gael and making it likely that Labour leader Eamon Gilmore would be Taoiseach. This did not eventuate, though, and Labour fell well below Fine Gael before the election. In the end, Labour won 19.5% of the vote, and slightly more than that in seats, as a result of preferences from Fine Gael. The only realistic coalition option following the 2011 election was a coalition between Fine Gael and Labour. Such a coalition was formed. This, however, was a dangerous position for Labour to be in. A Fine Gael government could be expected to make spending cuts, as they had campaigned on a fiscally conservative platform. However, Labour, being a left-wing party, would suffer political damage from being in a government which made such cuts. Indeed, that is what has happened to Labour under their coalition with Fine Gael. Their support has consistently slid under the coalition, both in opinion polls and in the European and local elections in May 2014. The party won just 5.3% in the European election, and lost their three (out of eleven) seats, as well as just 7.2% in the local elections. It is generally expected that they will win less than ten percent of the vote at this election, and will play a relatively minor role in the coalition formation process. They will likely be a beneficiary of Fine Gael preferences, which will mean they avoid a total wipeout. Formed from the opponents of the Anglo-Irish Treaty, they came second in the first few Irish elections they contested, but in 1932 they won the most seats by a large margin, and formed a minority government. This state of affairs continued, with Fianna Fail eventually winning an absolute majority in 1938, losing it, then winning it again, until 1948. At this election, Fianna Fail won 69 seats, just 8 short of a majority. However, the five-party opposition (with Fine Gael and Labour as the major parties) were so strongly opposed to Fianna Fail that they formed a coalition, with a very narrow majority. This coalition did not last, and in 1951 Fianna Fail were back in government. This election result, with Fianna Fail around the majority mark, Fine Gael back with 40-50 seats, and Labour with 10-20, persisted for the next four elections. Fianna Fail entered opposition in 1973; this began a period of changes in government, with each election seeing a change in government from Fianna Fail minority to Fine Gael-Labour coalition. This only ended in 1989, when, for the first time, Fianna Fail formed a coalition with the liberal Progressive Democrats. The Fianna Fail government was re-elected in 1992, with the support of Labour. Labour left coalition in 1994, and Fianna Fail entered opposition, but the Fianna Fail-Progressive Democrat coalition won the 1997 election, under the leadership of Bertie Ahern. This coalition served until 2007. In that year's election, the Progressive Democrats collapsed, meaning that Fianna Fail (on 77 seats, with 84 needed for a majority) needed a new coalition partner. They chose the Green Party, which had 6 seats, as well as doing deals with the remains of the Progressive Democrats, on two seats, and a number of independents. During this parliamentary term, Ahern was resigned, and was replaced by Brian Cowen. As you have read, the economic crisis led to Fianna Fail's support collapsing. Despite the resignation of Cowen and his replacement by Foreign Minister Michael Martin, their defeat in the 2011 election was disastrous for the party. They lost 51 of the 71 seats they held before the election, and their vote plummeted by 24%. For the first time, they were not the largest party. Their polling performance over the past term of the Dail has been mixed. They have made a slight recovery overall, it seems, and their lack of governing status means that they could do better on preferences than they did in 2011. It's clear, though, that they are going to be a long way from their historical levels of support. Sinn Fein were the original Irish nationalist and pro-independence party. Their landslide victory in the 1918 United Kingdom election was one of the key events in Irish independence. However, the party opposed the Treaty, and then had the bulk of opponents leave to form Fianna Fail. They are a left-wing party, supporting higher government spending and higher taxes. However, their most public views have been on Northern Ireland. Upon Irish independence, the Protestant North stayed part of the United Kingdom. Sinn Fein strongly believe that the North should become part of the Republic of Ireland, and this Irish nationalism is an important part of their political position. The split meant that their support plummeted in the Republic, leaving their only relevant political presence in Northern Ireland. Even there, they had little relevance; they did not contest any elections for the Northern Irish Parliament, and following 1959 did not contest Westminster seats either. They fell out of relevance for a large period. However, their relevance increased in the 1970s, when agitation by Northern Irish Catholics turned violent, and the Irish Republican Army emerged as a terrorist organisation supporting unification. Many consider Sinn Fein and the IRA to have been closely related during this period. Sinn Fein's policy was normally not to contest elections at all. However, this changed in the mid-1980s, when they contested local government elections in the Republic and the North, as well as Dail and Northern Ireland Assembly elections. They fared poorly in the Republic, but polled strongly in the North. The party consistently failed to make much of a breakthrough in the Republic. However, they have polled strongly in the North, and, following the brokering of a new system of power-sharing government, they have overtaken the Social Democratic and Labour Party, the more moderate pro-Catholic party in the North, to become the leading pro-Catholic party in the North. With many of the issues that led to their entry into Northern Irish politics resolved, Sinn Fein made something of a pivot towards the Republic. They won 5 seats in 2002, and lost one of them in 2007. An underwhelming result, to be sure. However, their anti-austerity rhetoric hit a positive note during the banking crisis. This was combined with party leader Gerry Adams resigning his Westminster seat and taking one in the Dail. The result saw Sinn Fein gain about 3% of the vote, and ten seats. The small vote gain compared to the large seat gain is largely a result of Sinn Fein losing some of its transfer-unfriendliness since 2007. Over the past term of government, Sinn Fein's polls have dramatically improved, as leftist voters have been disappointed by Labour's performance. Their gains were made about the time of the government's first budget, and they are currently polling at around 20%, in a similar place to Fianna Fail and way ahead of Labour. However, their radical left-wing views on economics, combined with concerns about the impact of a Sinn Fein government on peace in the North, means that Sinn Fein will likely stay out of government. The far-left outside Sinn Fein will be represented in this election by a coalition of the Anti-Austerity Alliance and People Before Profit. These parties are more left-wing than Sinn Fein. At the last election, far-left parties similar to the ones grouped under this coalition won 2.7% of the vote and five seats. The polls have them between 2-5% of the vote; however, as they are only running 31 candidates, and there are 40 multi-member districts, this support is likely to be overstated. Either way, they are unlikely to play a role in government, although their preferences could be useful for Sinn Fein. The Greens, a fairly moderate left-wing party with an unsurprising focus on environmental issues, were a minor but persistent presence in the Dail from 1989 to 2007, winning between one and six seats. However, their decision to enter government following the 2007 election meant that they were tainted by the unpopularity of the Fianna Fail government. Their vote share collapsed from 4.7% to 1.8%, and they lost all their seats. They have made something of a comeback over the last term of government, coming within less than a percent of Labour in the European election (Labour 5.3%, Green 4.9%) and it looks likely that they will be able to pick up more preferences at this election. This could mean they could win a few seats. Renua Ireland is a fairly new political party. It was formed by Lucinda Creighton, a former Fine Gael member of the Dail and two other Dail members in 2015. It is a fairly right-wing party, with one of its key policies being a flat income tax; their policies on social issues are not made clear, though presumably they are right-wing, as Creighton voted against a bill to expand access to abortion. The party has struggled to gain traction, and they have stayed below 2% in the polls since their formation. Creighton herself is running in the four-member district of Dublin Bay South, which may be making things somewhat difficult for herself because of the higher quota. If they win one or two seats, they could be a coalition partner to one of the larger parties. The Social Democrats are a relatively new split-off from Labour, also formed in 2015 by three Labour Dail members opposed to the government's policies. They are more left-wing than Labour both on social and economic issues. Like Renua, they have struggled to make much of an impact, with 2-4% of the vote; they may win some seats, but they are unlikely to be willing to enter any government. Finally, there are the independent candidates. Western Europe has institutionalised party systems, and most countries use party-list forms of proportional representation, which often do not allow for independent candidacies. For this reason, Ireland stands out as having large numbers of independents. At the last election, fourteen independent members were elected. Of course, independent candidates enter the field for different reasons: some are left, some are right, some are non-partisan and are just interested in development for their constituencies. For this reason, the impact of a large number of independents depends heavily on who those independents are. Polling for independents has been fairly strong over the term of the legislature. Independent polling has been at 20-25%, and independent candidates won 20% of the votes and 3 of the 11 seats at the European Parliament election, as well as 23% at the local elections. However, independent polling has fallen back recently; perhaps due to the improvement for Fine Gael, or due to the national party campaigns taking voters' minds back to the issue of choosing a government. Independent candidates are polling at about 15%, and a fair few independents may be elected. This could complicate government formation, as it is more difficult to deal with ten independents than a disciplined ten-member party. It could increase the amount of pork-barrel spending, as the government may need to throw projects to useful independents in order to win confidence votes. Fine Gael has fallen back in the polls in recent days. However, it still looks likely that they will be the largest party. For this reason, their leader Enda Kenny is likely to stay as Taoiseach, as alternative governments would require the entry of Sinn Fein, which would be unlikely. However, it's unclear what sort of coalition will be formed. This will depend on whether the current Fine Gael-Labour coalition will be able to pick up support from other parties to stay in office, or whether Fine Gael will need to do a historic deal with Fianna Fail. Such an alliance has never happened before, but that was because Ireland had a much less fragmented political landscape. The rise of Sinn Fein, and the fragmentation of the rest of the parties, is not uncommon across Europe, and it will lead to broader alliances within the more moderate parties.